"The Curious Case of the Werewolf That Wasn't, the Mummy That Was, and the Cat in the Jar": A mummified cat, a secret agent, and an aristocrat entangle Alessandro Tarraboti (father of Alexia Tarraboti from the Parasol Protectorate series) in a rollicking, wry adventure into the supernatural secrets of ancient Egypt. "Marine Biology": Inconveniently a werewolf, unexpectedly alive, and secretly gay, marine biologist Alex finds himself forcibly shackled to a flirty merman on the hunt for some sinister selkies. An unconventional romance between impossible partners told with the kind of wit and comedy that made Gail a household name. "Fairy Debt": Despite being a fairy, Cups can't grow wings due to a death promise to a local king. Entering service in his castle as the Least Jester, she must find a way to earn her wings while navigating the hazards of cupcakes, tea demons, and the occasional Earth dragons. "My Sister's Song": Fantasy, history, and subversive strategy collide in this Roman-era tale of a warrior, Mithra, who must repel an entire legion alone and armed only with a very peculiar weapon. Her sticky solution to this impossible problem must be heard to be believed. Featuring performances by fellow fantasy writers Philippa Ballantine, Chris Lester, and Tee Morris as well as an original soundtrack by composer Danny Schade. ©2001 Gail Carriger (P)2014 ArtisticWhispers Productions, Inc. The stories in here are cute, but I listened to this on audiobook and the audiobook was awful. The stories range from urban fantasy, to fantasy, to steampunk. The narration of the first two stories especially was very juvenile sounding; definitely not narrated by a professional narrator and was painful to listen to. All of these stories as done as full audio productions, so they have different actors for different characters and sound effects. It was distracting and hard to listen to. Additionally the volume was very unbalanced. The narration would be very loud and then dialogue between characters was very soft. I enjoyed the last two stories more than the first two. My Sister’s Song is beautifully written and absolutely magical with a touch of humor to it. The Curious Case was an interesting story about Alexia’s father (from the Parasol Protectorate series). Overall I could have taken or left it. Just do not listen to this on audiobook...it’s awful. See below for more detailed reviews on each story. This was a cute story about a gay werewolf struggling to find his place in his pack. The romance that the werewolf has with the merman is cute, but it would have been better if it had been developed a bit more. I felt like the romance was a bit whirlwind and the whole story more of a sketch than a well thought out novella. It was a fun little story but would have been better had it been filled out more and longer. Narration for this book was awful; I would recommend reading this instead of listening to it. This was a short story about a fairy who needs to fulfill her mother’s debt to a king in order to get her wings. It was again a cute story but was very short and not all that filled out. I did enjoy the fact that cupcakes saved the day :-) Narration for this book was absolutely awful, the person reading it was not professional and sounded very awkward. This was a beautifully written novella, I really enjoyed it. It was about a warrior woman and her clan and the unique way they stood against the Roman army. Narration for this story was much improved over the last two novellas, mainly because the majority of the story was told from one person’s perspective. There were still some issues with narration; for some reason the narrator is way louder than the parts where people are talking to each other. This meant I had to turn the book up when people were talking to each other and they get my eardrums blasted when the narrator came back on. This was a well done short story about Alexia’s father. It was well written and good to get some background on Alexia’s father and how his supernatural talents worked. This one was better narrated than the first two but still not great. Great writing but performances underwhelming. Love the author's style! (Parasol Protectorate fan-girl) but the old fashioned radio-style performance was not to my taste at all. I'll stick to one-reader audiobooks in future. Amazing full cast but mixed bag of stories. 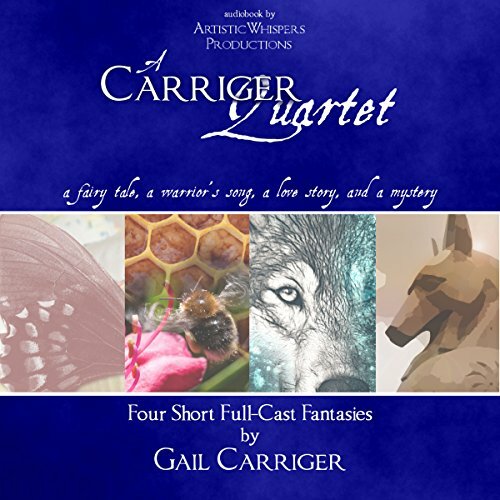 Would you consider the audio edition of A Carriger Quartet to be better than the print version? Had no idea when I bought this that it was a full cast production -- complete with background music and sound effects! I was utterly delighted. Neither the effects or the music overwhelmed the larger story, and it was fascinating to hear the dialogue truly come alive with different actors. What was one of the most memorable moments of A Carriger Quartet? Best by far was the twists & flirtation in the "Marine Biology" story. I don't think I've laughed so hard in AGES. Not only was it delightful to see Carriger write for a modern time (I've only ever read her Protectorate series, which is Victorian) but the full cast absolutely blew this one away. I was stuck in stop&go traffic at the time and I'm sure the nearby drivers must have thought me insane as I shrieked with laughter. Sound effects and music were subtle and never distracted from the story -- things like laughter, a gunshot, or a closing door. The narrators did a fantastic job of conveying emotion with pace & tone. "Marine Biology" and the Werewolf stories had me on the edge of my seat, definitely. For me, this was a 2/4 set -- the Fae story was okay, more of a kid's story than anything. The Sister's Song story was kind of lackluster and to be honest pretty horrifying. The casual way in which the character describes how her tribe deals with the end result was a bit rough. The full cast remained amazing in both, but I could have done without those two stories and have been happy with the Werewolf & Marine Biology ones. This is more of a play than an audiobook, as many actor voices are used in narration and include music sounds and soundtracks. Because it's a play with different voices it was hard to listen to while driving. The voices took me a while to figure out who was who, so I had to concentrate on the story instead of my driving. Not a good combo, so the stories had to wait. This frustrated me greatly. Apparently this play format was a crowdfunded project and Gail Carriger was also the executive producer of this play/audiobook. I greatly admire Gail and her writing, but in this case I should have purchased the written version rather than the audiobook. The play wasn't badly done, but it was confusing at times, and definitely not the level of professionalism and clarity I would have expected. The different voices, accents.. and in one story the character talked so fast I had to check and see if I'd accidentally hit the higher playback speed. On that one I couldn't even wash dishes while listening, as it had to take my full attention. The first story includes an alternative lifestyle (Gay) theme, so if that bothers you then skip over that one. I found the story lines to be very simplistic. Honestly, only the last story focusing on Alex Terrabotti (spelling?) grabbed my interest like her Parasol Protector books have. I'm sorry Gail, but I've had to rate the performance and stories only 3 stars. I'm even considering returning the book to Audible for a refund, then going and buying the written (or Kindle) version instead. I'm pretty sure I'd prefer the voices in my head over trying to figure out who was talking when. As a true admirer of yours it breaks my heart to write this review, but having met you in person (Portland, OR) my feeling is that you'd prefer honesty. Love the author but the narration is horrible! Would you try another book from Gail Carriger and/or the narrators? I enjoy Gail Carriger's books. They are fun mind candy. I would definitely try another book from her but would not actively search out the narrators. I had to force myself to listen to the first 45 minutes before I just couldn't take it anymore. I spent so much time being irritated by the narration that I have no idea what the short stories are about. There were too many narrators which was distracting. This was a performance fail. Did A Carriger Quartet inspire you to do anything? Yes. This is the first time I have disliked a performance so much that I had to warn other listeners. The stories are good but really degraded by the choice of a full cast recording. The sound effects are annoying and distracting and cartoonish. The multiple voices make the recording sound disjointed. It really detracts from the story. It's like trying to focus on someone telling you a joke in the middle of a disco dance floor with a gaggle of clowns popping up on all sides of you! The stories were good though if I ever want to reread them I will do it in a different format. As much as I love Gail Carriger that was painful to listen to and in the future I will not bother with full cast productions. Why would you do that to otherwise good stories? Why? I really liked this series. The first book was by far the best, and the idea of a gay werewolf was really well done and I loved it. The 2nd and 3rd books were good, but didn't live up to the first one. The last book was the Parasol Protectorate story that I wanted to get the book for in the first place, but I had already gotten it separately. That is my only downside to this, that it wasn't apparent enough what the books were when I bought it, and would no have gotten the individual story if I had known. Still great though! I absolutely loved the Parasol books, but this one I couldn’t finish. I tried several times. The narration is awful! Maybe in print, but don’t bother listening to this. I’ve read several books by this author & found them entertaining. I couldn’t even get through the first chapter of this book. The “full cast” narration was amateurish & distracting. Totally ruined what might have been good stories. The first group of performers sound like a high school production. It's terrible and the writing was simplistic. I enjoyed the second book because the actors and pace were much better and the storyline unique. The third book just didn't hold my interest. It didn't seem to know what it wanted to be. The Fourth book swung back-and-forth between wanting to be a Sherlock Holmes type book and on the other hand, cheating in the writing style as if there was no need to develop the character and stay true to it. I suppose it could be put under the author wanting to surprise but to me it came across as shabby writing. I will be avoiding this writer in the future.